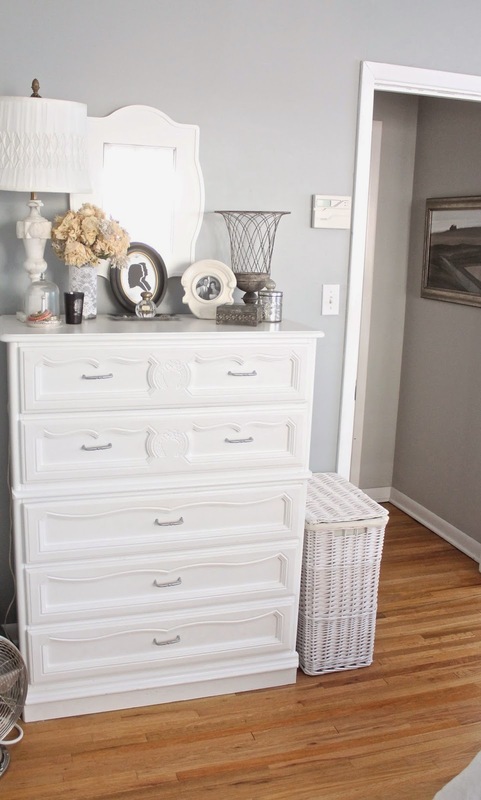 The walls are painted Boothbay Gray by Benjamin Moore. After choosing a shade of gray for every rooom in our home, I can say that this is the one I did not pick well. I am so happy with our other grays, but this one went totally blue on me. I would love to repaint at some point, but just don't have it in me right now. The color is very lovely, it's just not what I had envisioned for the space. I feel like this room has a good foundation laid, with the bed, dressers, bedding and curtains, but now it needs some finishing touches. Currently there is a ceiling fan which will soon be switched out for a chandelier (more on that below). In the corner is the door that leads to our tiny little master bath. If you remember our last house, our bedroom looks mostly the same - same furniture, bedding, curtains, etc. Eventually I might change the curtains, although honestly I still really like the softness the simple white ($5!) sheers bring to the room. It feels incredibly peaceful and tranquil all the time. So here is what will be added/changed. I've already purchased the French style chandelier and am excited to get it installed. 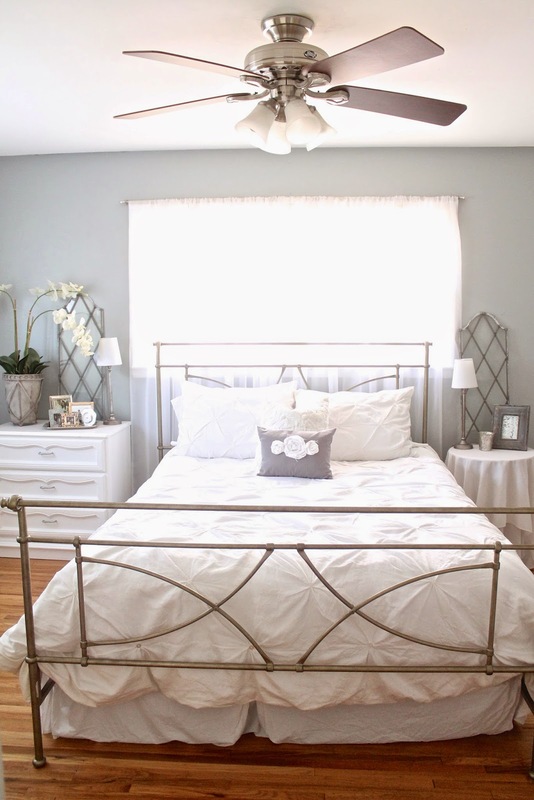 I will be keeping our white pinch pleat bedding, but adding the Pottery Barn Samantha duvet at the end of the bed along with two Euro pillows. 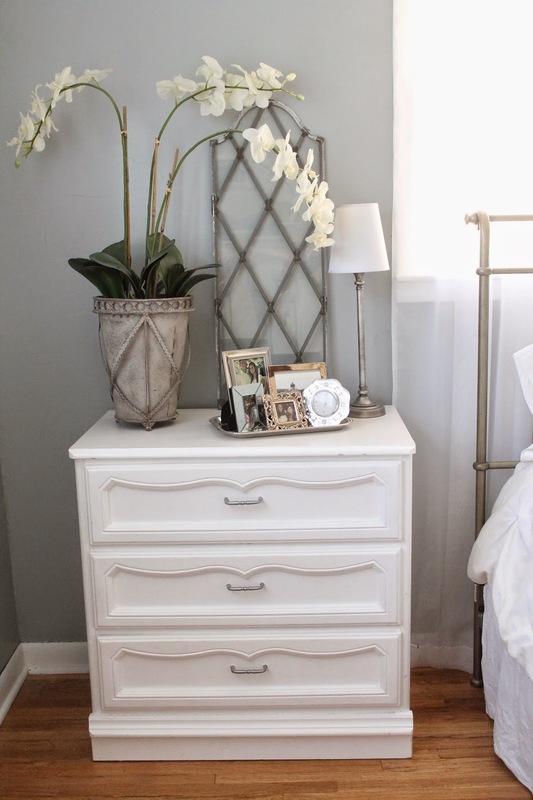 I've also purchased the mirrored Hayworth nightstand for Matt's side of the bed (as great as the plywood table I've had since I was 10 has been...it was time for an upgrade!). Actually, the Hayworth line from Pier 1 was the inspiration for our entire room when we were married. It is why I bought the white bedding and chose the bed I did. This is the first piece of the line I have actually purchased, but the silver and mirrored look was what sparked my direction three years ago. 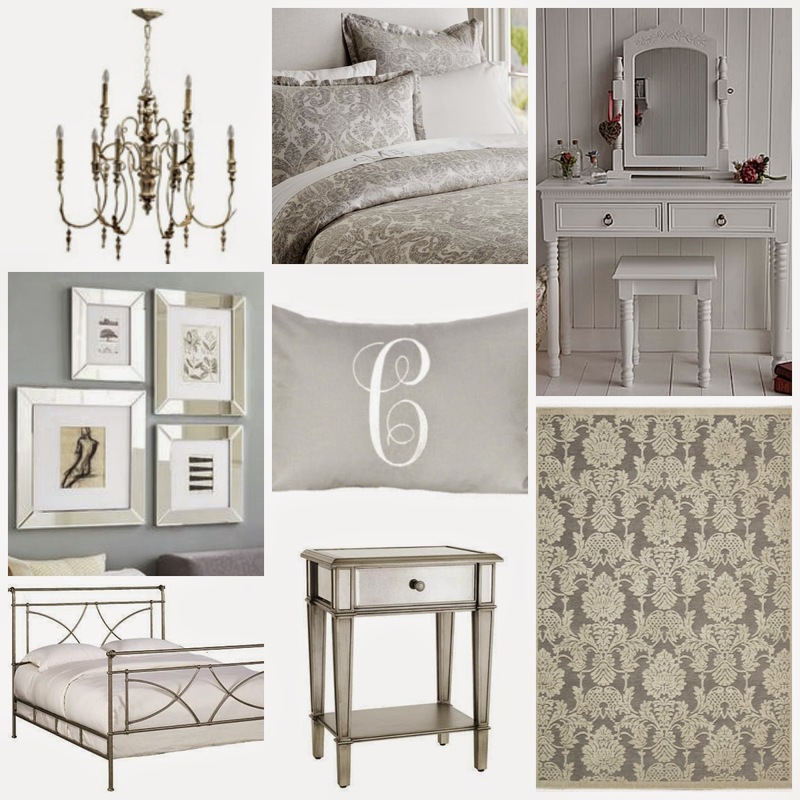 I also plan to purchase this silver damask rug if it will ever come back in stock. And I got a beautiful antique vanity (which looks very similar to the one pictured) at an estate sale recently. It's hanging out in our garage waiting for a coat of white paint right now. I also hope to find a few mirrored wall frames to hang, and especially to frame our large professional wedding portrait (which has been relegated to the floor in the corner for three years now...). I can't wait to see it all put together. Everything is so pretty! This is completely lovely!! Can't wait to see it all pulled together. xoxo.